CIMMYT will establish and operate the maize DH facility, including field activities and the associated laboratory. Occupying 12 acres of land, the facility is estimated to produce at least 30,000 DH lines a year. CIMMYT hopes the facility to be operational by the last quarter of 2019. The maize DH facility, funded by the CGIAR Research Program on Maize (MAIZE), fulfills a very important requirement of the region. It has the potential to accelerate maize breeding and hybrid development and significantly increase genetic gains through maize breeding in Asia. During the 13th Asian Maize Conference in Ludhiana, India (October 8-10, 2018), several partners — including the Indian Institute of Maize Research (ICAR-IIMR) — emphasized the urgent need for a state-of-the-art maize DH facility that could serve breeding programs across Asia. 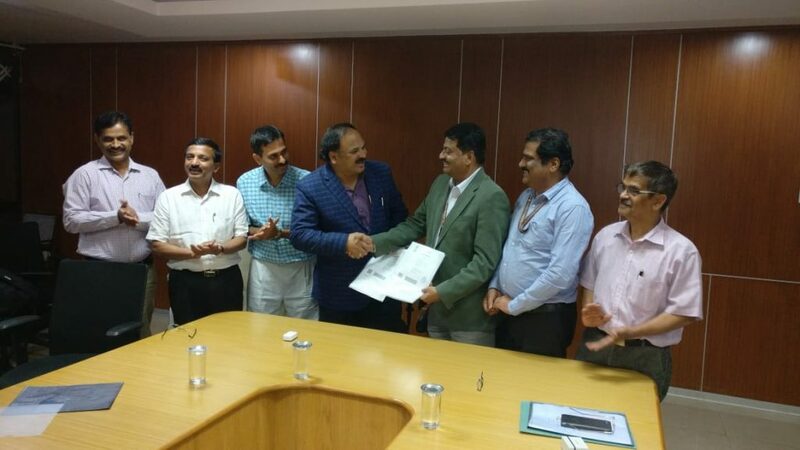 The signing of the collaboration agreement took place on February 18, 2019 at UAS-Bangalore’s campus in Bengaluru. CIMMYT was represented by B.M. Prasanna and BS Vivek, Senior Maize Breeder. UAS-Bangalore was represented by S. Rajendra Prasad; Mahabaleshwar Hegde, Registrar, and Y.G. Shadakshari, Director of Research. DH maize lines are highly uniform, genetically pure and stable, and enable significant saving of time and resources in deriving parental lines, which are building blocks of improved maize hybrids. Over the last 12 years, CIMMYT has worked intensively on optimizing DH technology for the tropics. Researchers released first-generation tropicalized haploid inducers in 2012, and second-generation tropicalized haploid inducers in 2017, in partnership with the University of Hohenheim, Germany. In 2017, CIMMYT developed more than 93,000 maize DH lines from 455 populations, and delivered them to maize breeders in Africa, Asia and Latin America.